If you dream of immersing yourself in Speyside whisky country then a trip to Rothes would be a good measure of your success. Set in the heart of the malt whisky trail with distillery pagoda turrets sprouting up at every turn, it is a perfect base for exploring the many attractions on its doorstep. Whisky, salmon fishing and castles – what more could you want? 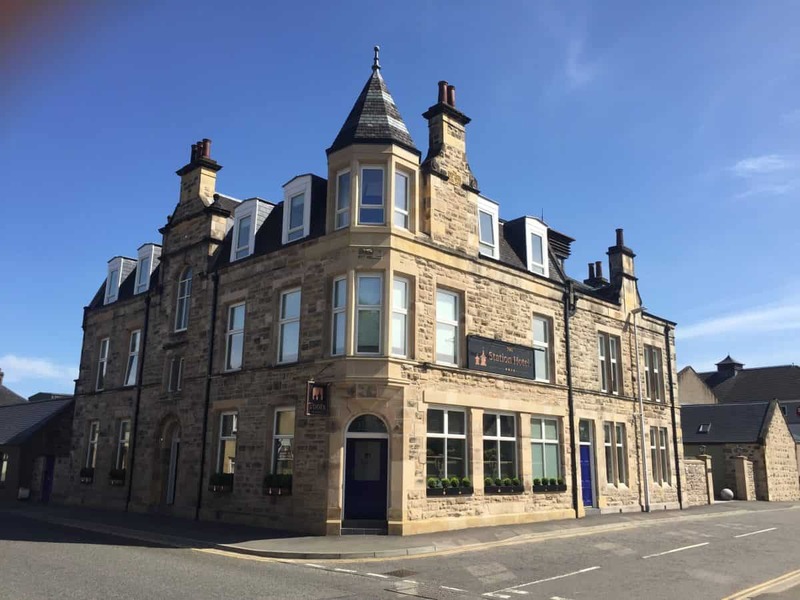 We set up base camp for one night, and the best part of two days, at an elegant and very dignified building which straddles a corner on the main street through Rothes and is home to the The Station Hotel. Whisky heritage is oozing from every pore of this lovely old building and its history spans almost 120 years. It is a kind of riches-to-rags followed by rags-to-riches story for The Station. The glory years were in the 50s and 60s when it was not unusual to see Rolls Royces parked outside as well-heeled country sports types piled in for salmon fishing on the nearby River Spey. In later years, it closed and began to crumble behind locked doors for a decade. Luckily, it still had admirers and The Station was rescued by its neighbours Richard and Heather Forsyth, who own Forsyth’s factory just a short distance away from the hotel, and it re-opened two years ago. 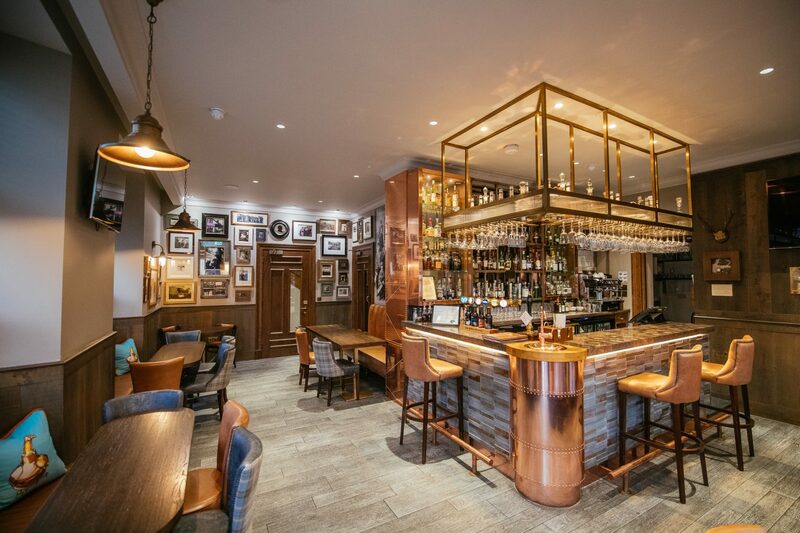 It’s been a labour of love for them, and a considerable financial investment, but The Station has been brought back to life as a stylish modern boutique hotel which pays homage to its proud whisky heritage. There are many telltale signs – a distinctive pagoda-style roof feature (pagodas were vital for air venting in distilleries and the architect gave them an Asian flourish), a beautiful copper still standing like a monument to the industry in the car park and the “Spirit Safe” bar inside which boasts not only plenty of character, but also a dazzling array of classic malts some of which are under lock and key. The still is a visitor attraction in itself, but also a signature mark of the owners who manufacture and supply this iconic equipment to the whisky distilleries. We flew in from London and wound our way up to Speyside past the homes of many top whisky brands which play such a significant role in Scotland’s economy. It’s also a signature part of the hotel where they boast 60 distilleries within a 50 mile radius. Some of them are easy to visit from The Station: the stunning new £140million Macallan Distillery is just eight minutes away by car. Within walking distance from the hotel are Glenrothes and Glen Grant distilleries. The River Spey is less than 10 minutes by foot and there are two castles close by – the ruins of Rothes Castle and Ballindalloch Castle. The hotel is also handily-placed on the route for the NE250 road tour, so you must take a look at the turreted A-listed cast-iron arched bridge at Craigellachie – built by Telford – just down the road. It’s an idyllic spot and people swim or paddle here in summer. A distinctive pagoda logo appears on most roads signs around here to remind you that there is always a distillery nearby, even although whisky purists call them cupolas. Inside the hotel there are an array of lovely paintings of most of the distilleries in the area. 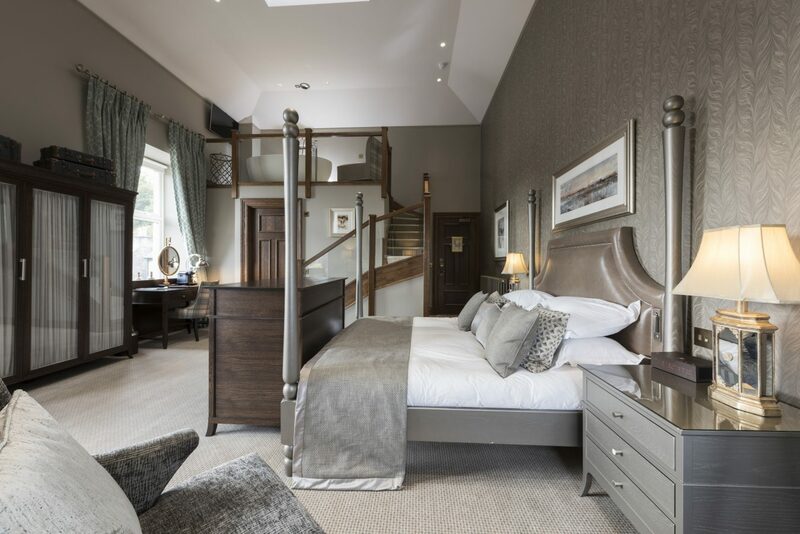 We settled in very comfortably to the striking and opulent Caperdonich Suite, named after a long-lost distillery. There was a freestanding Victorian bath on a split-level mezzanine floor. The roof-top pagoda feature I mentioned is built into this room’s ceiling and a remote control enables you to change the lighting colours around it. A giant television screen rises from the end of the vast Emperor-size bed. With windows on two sides, you can enjoy views of Ben Aigan to the east as well as the Craigellachie distillery in the distance. 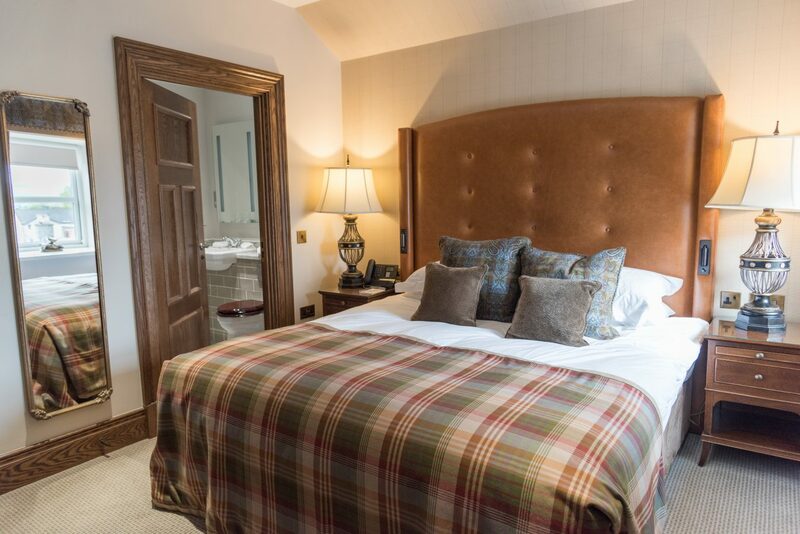 It has “special occasion” written all over it and while the cosy fireplace and complimentary single malt on arrival takes you back to bygone days, there is also superfast broadband at your fingertips. 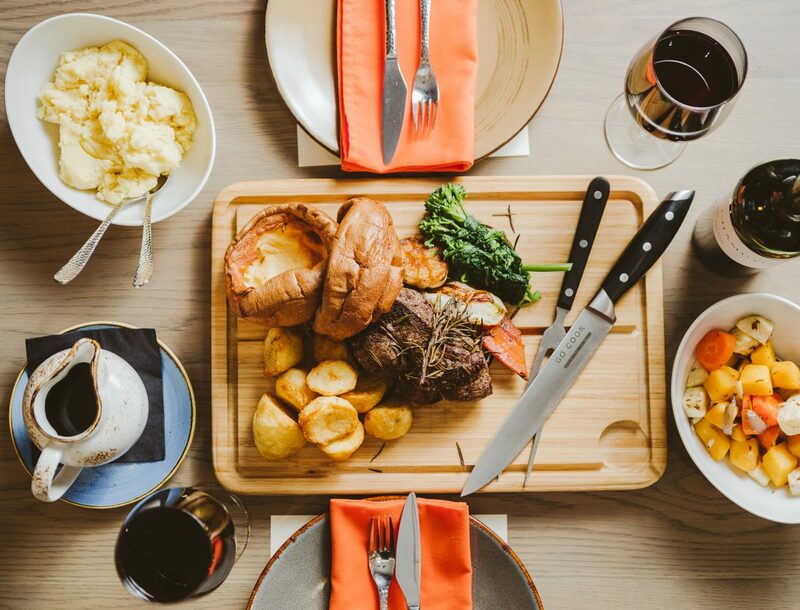 There is plenty to lure you downstairs, however, with excellent food and drink on offer in the friendly and welcoming Toots cafe bar and bistro, and a separate elegant dining room known as Pagodas. 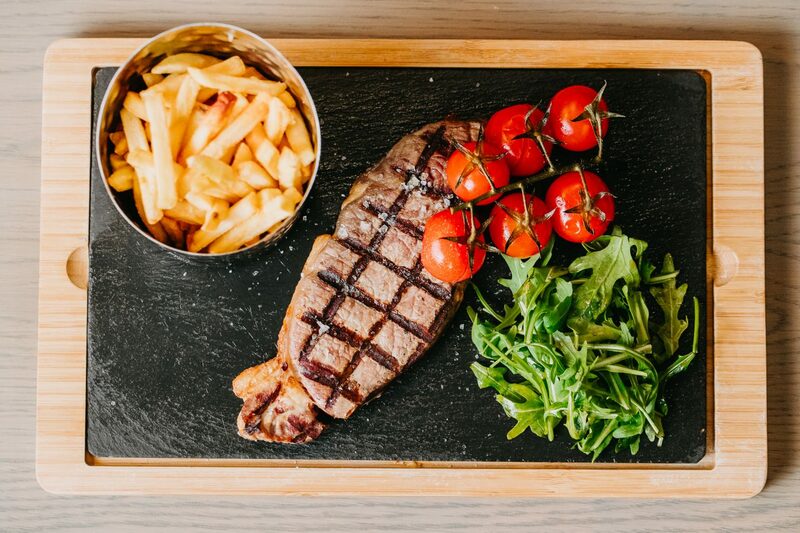 They share menus and offer an excellent array of dishes using local produce, such as Portsoy smoked haddock and salmon along with Scottish beef steak and a range of burgers. The Head Chef Stuart has recently had a charcoal oven installed which gave the most stunning barbecue flavours to the steaks we had. I can vouch for brilliant service from the waiter-served hot breakfasts. too. The name Toots comes from the family’s own history – Ernest Forsyth, who ran the former copperworks from which the current factory grew, was known universally as “Toot”. The sound of bottles chinking together is never far away here as tourists load them into their boots on the hotel car park after distillery visits. Guests flock from far and wide and we hope to return there sometime soon to this stunning part of the world and it’s fabulous hotel.